We usually just go out to eat for Valentine's Day, buy some chocolates for ourselves and our kids, and eat too much of everything. 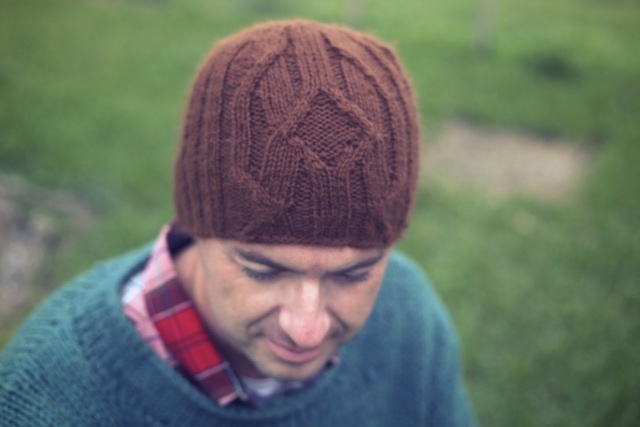 I hadn't thought of doing anything differently until I saw Maximus, a hat pattern by Libby Jonson, of Truly Myrtle. 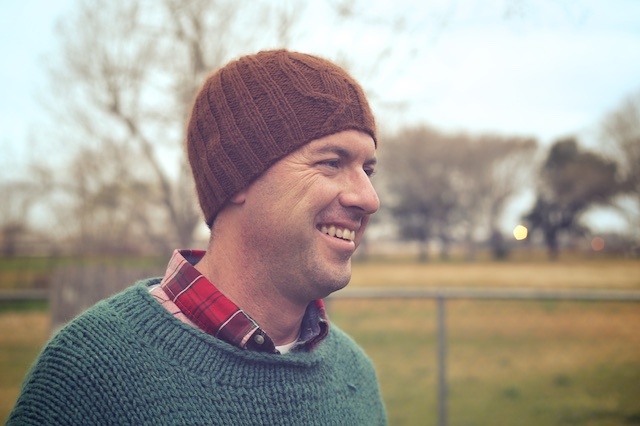 It is such a nice design for a man and my husband did need a hat for the occasional freezing soccer game. So, I picked out an incredibly soft skein of pure alpaca worsted and cast on. You see, he thinks he looks silly in hats. I think that's something people who rarely have to wear winter hats think. Global warming is real, at least in southeast Texas. It's ridiculous. I'm still running in shorts and tanks. I haven't had to cover my patio plants with old sheets once- in two years! I'm not too sad about that part, but I am pretty bummed about never having sweater weather. But, if it is going to be cold a few days of the year, they will, without a doubt, be during one of my son's soccer games... in the rain. 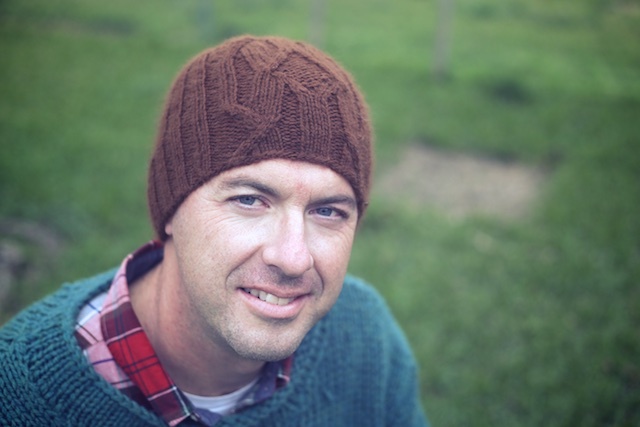 So, now my husband will only need to own 20 more warm hats to be as prepared as I am for winter. He doesn't look silly, does he? He does look embarrassed that I'm taking his photo, though. Our neighbors were outside, probably tanning in swimsuits and running through sprinklers, while we took woolly hat photos. It does make for an awkward FO photo shoot. 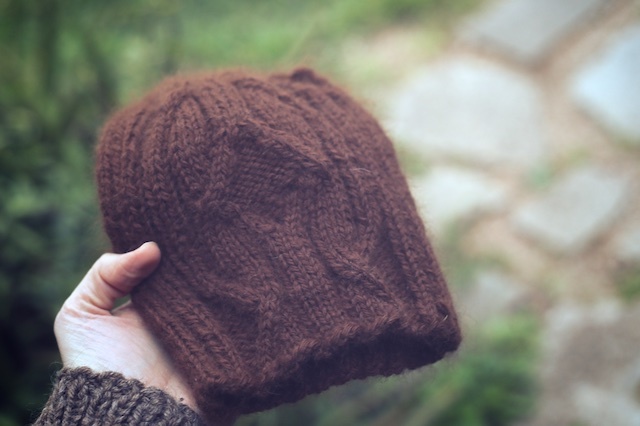 Details: I used size US 4 needles and knit this hat in two days. 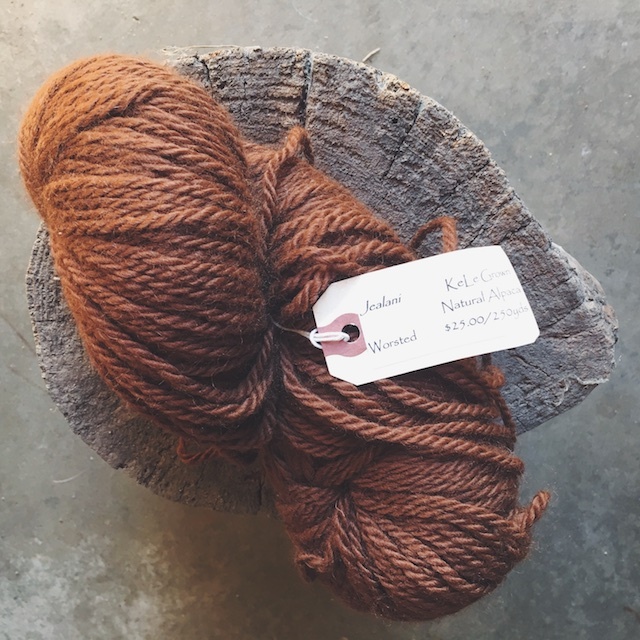 The alpaca yarn came with a tag that says Jealani and Kele Grown. That's all. So I'm thinking it may have come straight from the alpaca ranch. 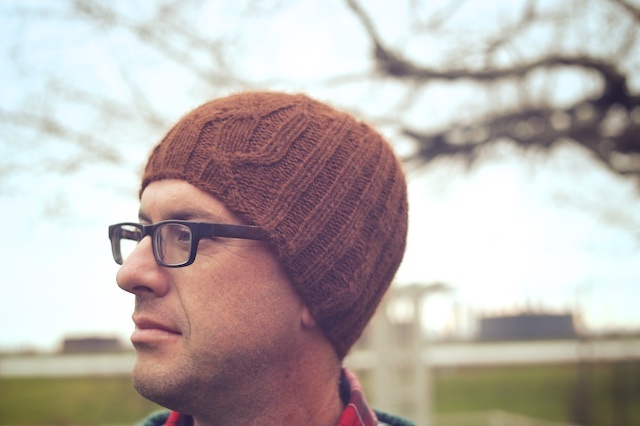 It was a prize from designer Hope Vickman in the Midwestern Knits KAL for her pattern, Furrowed Pullover. 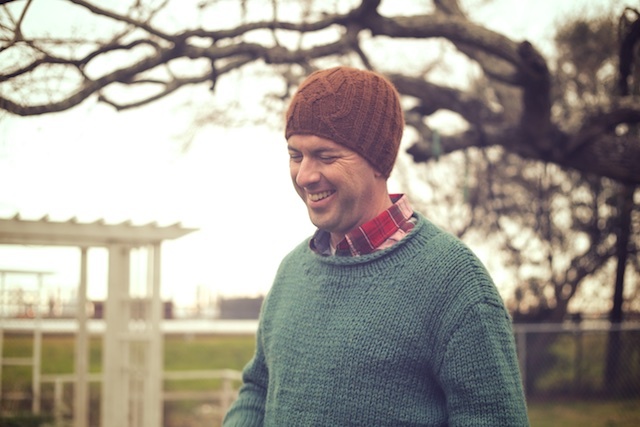 Remember that beautiful, gorgeous, alpaca blend sweater with the big foldover collar? I've worn it exactly once this "winter." Ugh. Anyway, the skein she sent me is absolutely the softest, natural alpaca I've ever felt. It seemed to slip through my fingers like butter. So much so that it was tricky to get used to working with it. 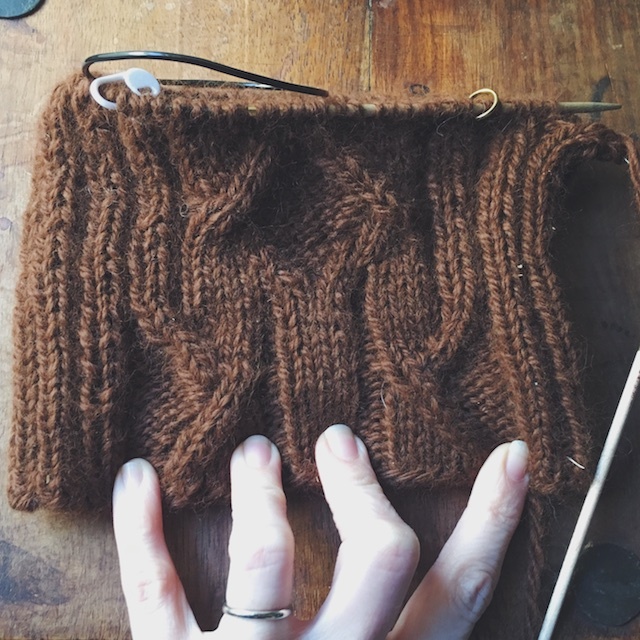 I wasn't sure the cable design of this pattern would look best in such a fuzzy yarn, but I knew it was a plain enough color that my husband wouldn't mind it and it was soft enough to tempt him when the weather is cool. 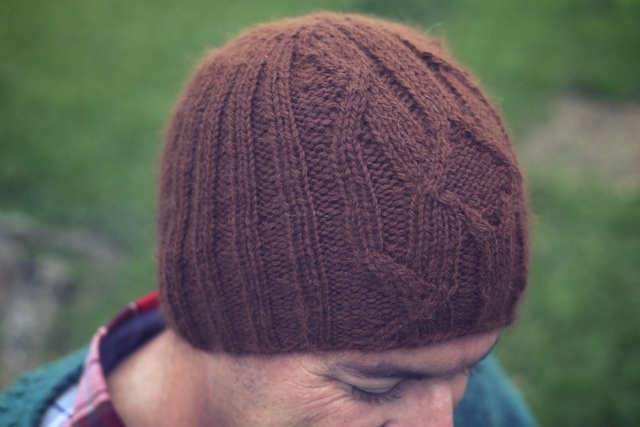 So there is a halo on this yarn, but when the hat is worn, and the stitch pattern spreads out to reveal itself, I don't think it detracts from the overall look. And, oh! it is so soft, I just kept petting it. Before he knew it was going to be a hat for him, my husband commented that it felt like our kitten's fur. I thought that was a good sign. 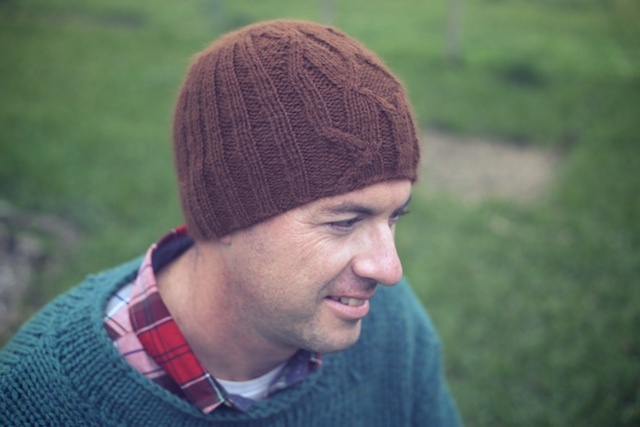 I want to knit another one, this time in merino worsted. I have a bit of Malabrigo in the Plomo colorway, but I'm not sure it's enough. I really think the tonal merino makes the cable detail shine. I keep staring at that little ball of leftovers and wanting to cast a Maximus on right now. But I have to control the WIPs! I also knit him some house shoes, but ran out of yarn and couldn't finish them by V-day. More on those, later. How about you, guys? 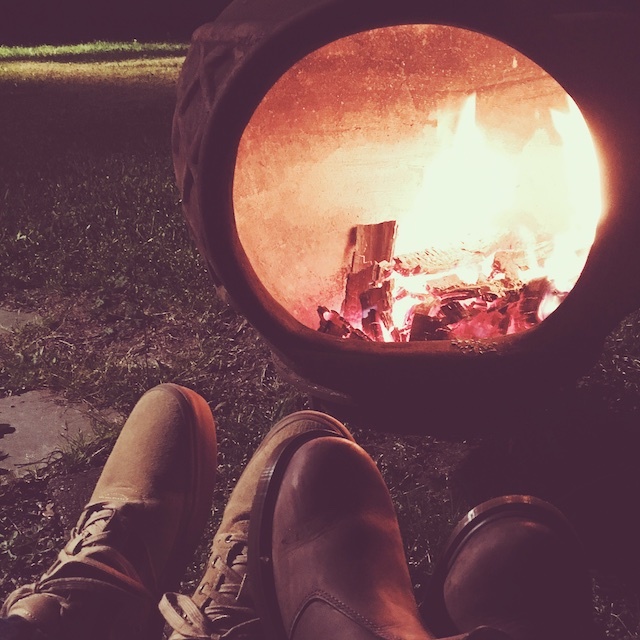 Did you do anything special for Valentine's Day, whether you have a significant other or not?